The entire journey takes around 8 hours and crosses 291 bridges, passes through 91 tunnels and climbs over the 2033 m high Oberalp pass - this is truly one of the world`s most spectacular rail journeys. 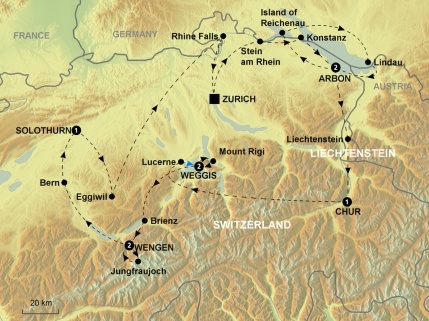 Individual transfer by train to Zermatt. Short walk to the hotel and check in. Zermatt lies at the foot of the Matterhorn. The town's tourist development is closely linked to what is most probably the world's most famous mountain, The Matterhorn. Zermatt, which is a car-free zone has preserved its original character and offers nearly unlimited possibilities for excursions. Overnight in Zermatt. 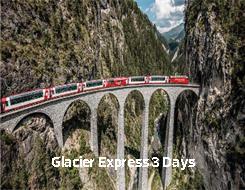 Today, board the world famous Glacier Express for a thrilling ride through some of the most dramatic scenery in Switzerland. You will ind out everything you need to know about this particular route through the Alps via headphones and accompanying guidebook - making sure you don't miss a single highlight. Overnight in St. Moritz.